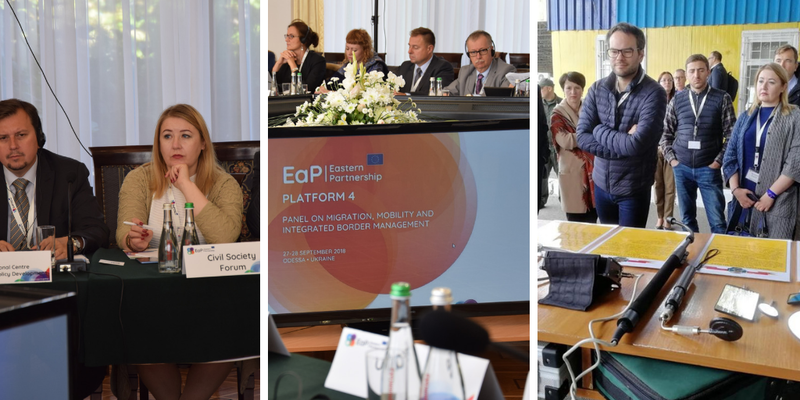 Recently, Eastern Partnership Civil Society Forum (EaP CSF) took part in two separate events, which happened under Platform 4, Panel 3: “Migration, Mobility and IBM – Integrated Border Management”. On both occasions, EaP Panel on Migration, Mobility and IBM (27-28 September in Odessa, Ukraine) and EaP Panel on Migration and Asylum: Meeting on Information Campaigns (11-12 October in Tbilisi, Georgia), EaP CSF was represented by Iryna Sushko (Europe without Barriers, Ukraine), who stressed the need for civil society engagement in formulating and implementing policies that affect borders and border regions. The panel in Odessa, hosted by the Ukrainian State Border Guard Service – with the support from DG HOME, DG NEAR and IOM – International Organization for Migration, focused specifically on the concept of IBM. Panelists looked closely at the way it currently functions in EU and EaP countries, addressing some of its present challenges and obstacles. EaP CSF contributed to the meeting by presenting a position paper “Civil Society Perspective: EaP Social and Public Dimension of Integrated Border Management (IBM)”, drafted for this occasion. In the position paper, Sushko provides a set of recommendations – to the border guard agencies of different EaP countries, the European Commission and EaP CSF itself. Civil society must be recognised as a full partner, facilitating the implementation of policies on border management. Its role cannot be underestimated, both as a source of expertise and channel to reach out to public opinion – on border issues, migration, human rights and other, important cross-cutting issues. Any policies on this topic must actively engage local communities, who inhabit border regions – we also learn from the paper. The participants heard about different local initiatives, aimed at enhancing further cooperation between stakeholders – at both international and interagency level. In fact, building lasting working relationships and trust with external partners is a running theme – seen as a pre-condition for smooth exchange of information, expertise and an integrated response, which applies to both customs and migration. The meeting ended with a field visit to Kuchurgan-Pervomaisk border crossing, providing a practical insight into successful interagency and international cooperation between Ukraine and Moldova. 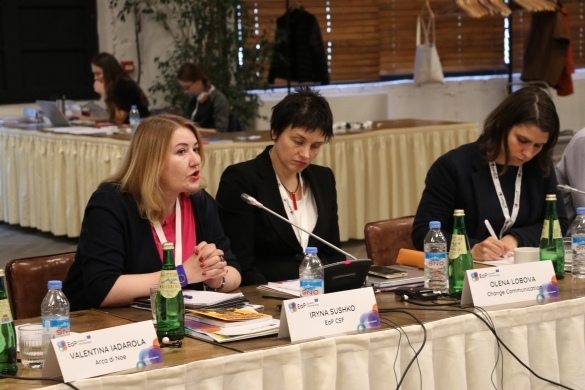 The second meeting, happening in Tbilisi, highlighted issues related to the growth of irregular migration, violation of visa-free and Schengen rules, as well as the asylum system – in the context of EaP countries. The participants examined different information campaigns, clarifying both the rights and obligations brought by the visa-free regime. We must work to “ensure a coordinated approach – involving the EU, EU member states and partner countries, all of whom can benefit from communication synergies”, stemming from joint efforts, learnt those participating in the meeting. Sushko also shared her own experiences of campaigning for a visa-free regime, in the context of Ukraine – in a presentation entitled “Communication channels for campaigning on visa-free regime”.